Oren Lodge | Hiking, trekking, and backpacking in Yatsugatake, Nagano, Japan! Differing from the more difficult treks of the Japan Alps and Mt. Fuji, the Yatsugatake Mountains offer trails for all skill levels, from beginners and families to well-seasoned hikers. You have access to several trails and peaks right from Oren Lodge. Located at an elevation of 2,330 meters and surrounded by nature, gaze at Mt. Iodake and Mt. Minenomatsume in the evening, and the starry night sky at night while relaxing in our semi-open-air, fragrant cypress wood bath. Beautiful forests, remarkable wildlife and alpine flowers, and a glistening, starry night sky. Compared to more popular mountains in Japan, Mt. Yatsugatake is seldom crowded with hikers, allowing you to truly escape into Mother nature. With our spacious rooms; cozy lounge with a warm, wood-burning stove; clean, flushing restrooms; and delicious meals with local dishes like our popular horsemeat hotpot, your stay at the lodge is guaranteed to be pleasant and comfortable. 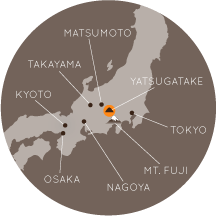 The Yatsugatake Mountains are easy to access from Tokyo, Osaka, Kyoto, and Nagoya by train. Make it a stop when moving between Tokyo and Kyoto, or enjoy the mountains for a weekend trip. Yatsugatake invites you to get out of the big cities and into Japan’s wild nature! Book your reservation now and enjoy some of the best hiking in Japan! Copyright © 2019 Oren Lodge. All Rights Reserved.